The ARCA Board of Directors is pleased to announce the 2012 Friends of ARCA Walkway fundraising project. ARCA has been a source of hope for so many in recovery. Now you can display and share your hope in permanent way through this innovative program. Your contribution to this project can be a special way to commemorate your own journey of sobriety — or that of someone you care about: a loved one, friend, doctor or counselor or sponsor — perhaps even someone lost to the illness of addiction. We have found a vendor who utilizes a laser engraving technique which “burns” into the face of the brick creating a glass surface that is naturally black and completely permanent. 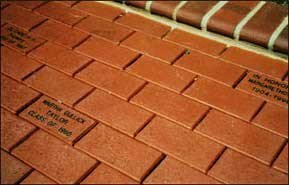 Each brick paver can accommodate 3 lines of text with up to 18 characters per line (including punctuation and spaces). You may order as many bricks as you wish. Bricks are $50 for individuals and $100 for commercial businesses. You may also purchase an anonymous (blank) brick for $10. To order, please contact our office at 877-615-2722. Financial information about this organization and a copy of its license are available from the State Solicitation Licensing Branch at (919)-807-2214. This license is not an endorsement by the state.